The goal of any regression model is to predict the value of y (dependant variable) based on the value of x (independent variable). In case of linear regression we would be using past relationships between x and y (which we call our training data) to find a linear equation of type Y = B + Ax and then use this equation to make predictions. Note that the observed (x, y) data points fall somewhat in a line but not exactly straight. 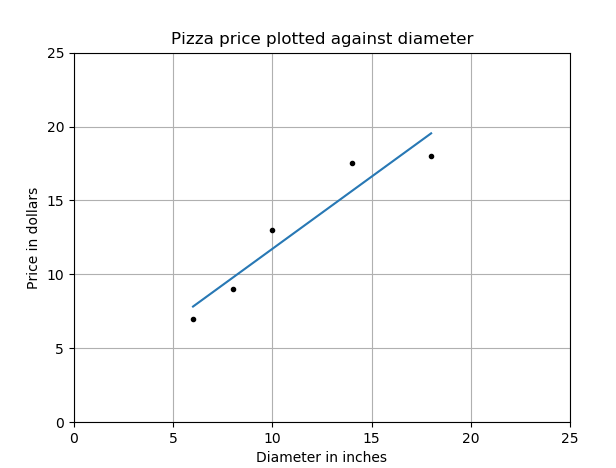 We will be using these data points to find an equation of a straight line which passes through all the observations which we call a linear relationship between diameter and price. 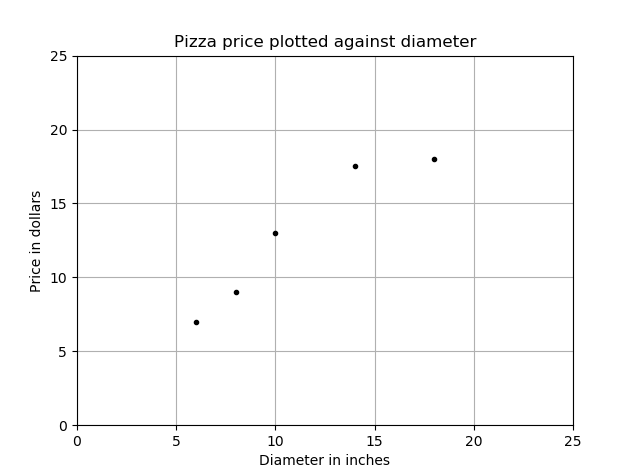 Where ‘x’ is the independent variable (the diameter) and ‘y’ is the dependent variable (the predicted price). The letters ‘A’ and ‘B’ represent constants that describe the y-axis intercept and the slope of the line. To find the equation of line, we would need to use the below formula to get A and B. Lets do the math in an excel sheet for now and find the values of A and B. The blue line represents our linear regression model line and the dots the training data set. Using training data to learn the values of the parameters for simple linear regression that produce the best fitting model is called ordinary least squares or linear least squares. We will discuss more about evaluating the fitness of a model with cost functions in our next article. Number of calories burnt versus the number of miles you run. The amount of electricity that is needed to run a house based on the size of house. Height and weight relationship, As height increases, you’d expect weight to increase, but not perfectly. Amount of alcohol consumed and the amount of alcohol in your bloodstream.